Where the jobs are and how to get them. At Neighbourhood Link we offer a variety of professional employment services designed to make it easier to find work - at no cost to the client. 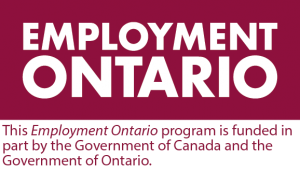 Employment Service Programs are funded by all levels of Government to support clients who are looking for employment or training. To access employment services you must be unemployed or working 20 hours or less, eligible to work in Canada, have a social insurance number (SIN) and photo ID. If you are interested in applying for these jobs, you are required to schedule an appointment with a Neighbourhood Link Employment Counsellor. Click here to contact us. Neighbourhood Link offers a variety of services and programs to help unemployed find a job. 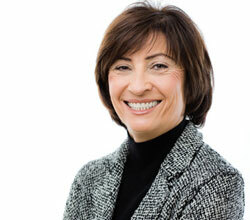 Counsellors provide professional one-on-one guidance and help clients develop a return to work action plan. Teaching is my passion, and teaching these computer classes would give me Canadian experience and really enhance my résumé. 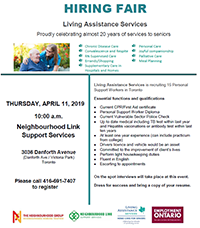 This hiring event will be held at Neighbourhood Link Support Services on APRIL 11, 2019 at 11 am. The company is seeking to recruiting 15 Personal Support Workers in Toronto. Please register to participate in the hiring event and bring the resume with you. All registered participants will be interviewed. Please refer to the Hiring Event flyer for more information. 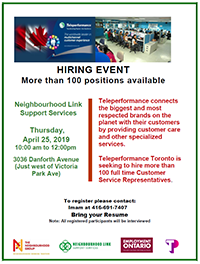 This hiring event will be held at Neighbourhood Link Support Services on APRIL 25, 2019 at 10 am. The company is seeking to hire more than 100 full time Customer Service Representative. Please register to participate in the hiring event and bring the resume with you. All registered participants will be interviewed. Neighbourhood Link organizes different Information Sessions each month. In this section, you will find information regarding the monthly Information Sessions.